يقع فندق فندق باسيفيك، كيرنز، المصمم ليناسب كل الضيوف سواء كانوا من رجال الأعمال أو السياح، في مكان ممتاز في أحد أكثر المناطق تفضيلاً في كارينس سيتى سنتر. إن موقعه الجيد الذي يبعد 0.5 Km فقط عن مركز المدينة يساعد النزلاء على الاستمتاع بمعالم المدينة ونشاطاتها. يضفي محيط الفندق اللطيف وقربه من Doongal aboriginal art, Underart Gallery, Orchid Plaza سحراً خاصاً على هذا الفندق. إن الخدمات الممتازة وحسن الضيافة العالي في فندق باسيفيك، كيرنز تجعل إقامتك تجربة لا تنسى. يمكن للنزلاء الاستمتاع بالميزات التالية: واي فاي مجاني في جميع الغرف, خدمة غسيل ذاتية, مجهز لذوي الإحتياجات الخاصة, مكتب الاستقبال على مدار الساعة, مرافق مخصصة لذوي الاحتياجات الخاصة أثناء إقامتهم في هذا المكان الرائع. تنعكس أجواء فندق باسيفيك، كيرنز في غرف الضيوف.تلفزيون بشاشة مسطحة, اتصال لاسلكي بالإنترنت, اتصال لاسلكي بشبكة الإنترنت (مجاني), غرف لغير المدخنين, مكيف هواء هي بعض الميزات الموجود في العديد من الغرف. يقدم الفندق العديد من الفرص للاستجمام كمثل حمام سباحة خارجي. إن فندق باسيفيك، كيرنز هو خيار ذكي بالنسبة للمسافرين إلى كيرنز، بما يوفره من إقامة هادئة ومرحة. يخضع العقار لأعمال التجديد من 25 يناير 2018 إلى 30 يونيو 2018. 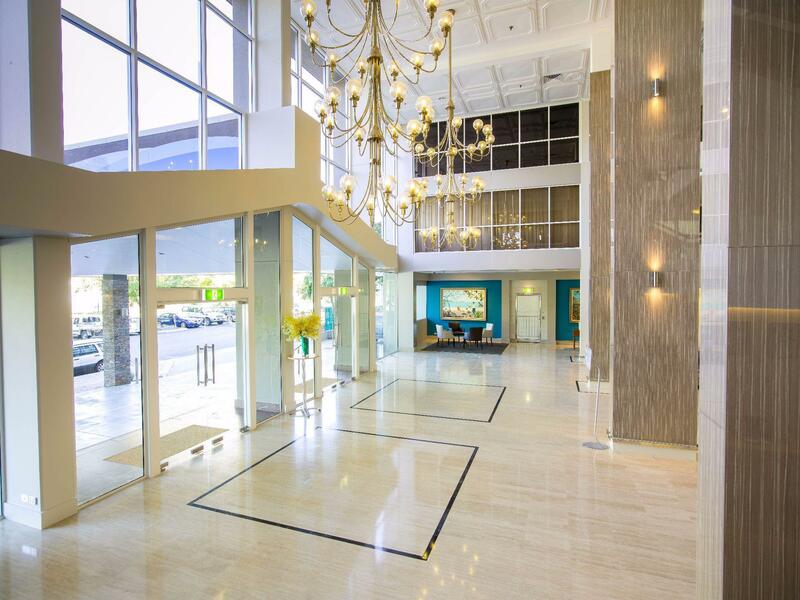 Hotel centrally located at the Cairns city centre, it is very convenient to go anywhere from the hotel. Just walking distance to the reef fleet terminal, railway station, shopping centre and lots of restaurants and shops around the hotel and the esplanade is in walking distance. Overall the hotel room is perfect, we have the really nice view when we woke up in the morning. I can't blame the staff for not wanting to be around in the lobby since upon arrival, I felt like I walked in to a sauna. However, I didn't really think they were friendly and gave me the feeling that they were being inconvenienced from checking in and checking out. But the hotel itself is a great location and clean. I would definitely book another stay here. The Pacific Hotel Cairns was very pleasant. We chose the Hotel because of its location close to the Ferry Terminal and reasonable cost. The staff from Reception, Room attendants, breakfast service and general staff were very friendly and helpful. I would have no hesitation staying at this Hotel again and/or recommending it to others. We stayed in the deluxe room and had fantastic views of the ocean & Trinity inlet. The rooms were clean and well maintained. The staff were very friendly and nothing was too much trouble. I would highly recommend this hotel and would definately stay again. Back to Cairns and the Pacific Hotel after a 10yr gap. Just as good as ever, if not better, especially the new Bushfire Brazilian restaurant. 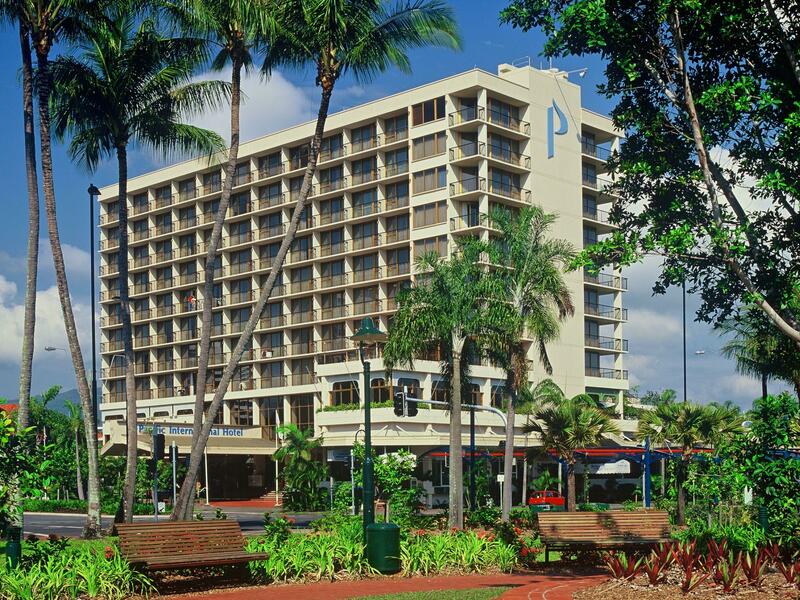 A perfect place to stay in Cairns, central to everything, whether for business or pleasure. We stayed in the deluxe room. The room is quite large with wonderful views. The internet is decent and room service is also pretty good. The buffet breakfast is okay even at half price, they do provide half price coupons for guests. The location is great close to the marina and esplanade. Lots of places to eat and shop around. The only drawback the room does not have a microwave. At the start, After the confusion about a room menu, it was later pointed out that the menu was on the TV? No minibar for such an elaborate room?? ?Again, once you get used to the TV menu options it stated that minibar packages were available for puchase? All in all, I would definitley stay in the deluxe room again. Not so sure about one of their regular rooms though! Was given vouchers for 50% breakfast discount but not accepted because I had it in room??? Staff are fabulous.. This was my first time in Cairns. I was very impressed with every aspect of the hotel - in terms of value for money, location, cleanliness, staff, and facilities. I was able to check in very early and I managed to secure a room on the top floor with a private balcony. This hotel is steps from virtually everything in the city. I've already recommended this hotel to my friends and I'll be sure to return anytime I'm in Cairns. Thank you for a really wonderful stay. Very convenient and close to everything. Plumbing could do with updating - when the room next door's bathroom was in use it sounded like we had left all the taps in OUR bathroom turned on full. Shower head not good at all but we were told that new shower heads were in the process of being installed. I came over for a conference so was barely ever in my room. Location was great for morning runs along the esplanade and close to supermarket and City Central. My only small negative note was the television had some channels that kept stopping or going fuzzy so couldn't watch a few stations. As I said I was hardly in the room but occasionally liked to watch a evening movie but was limited to only a couple of channels due to TV picture playing up. All Staff were exceptionally polite, helpful and friendly and I always returned to a lovely tidied, clean room at the end of my day. The hotel is very well located, right on the Esplanade. The room was spacious and convenient. Staff was friendly. There is parking available for hotel guests, which is also useful. Breakfast is pricey but we were provided with a discount voucher at reception, which made it good value for money at the end. Overall very positive experience. The hotel is very well located in the Esplanade for easy access by public transport.. The Ferry terminal is just across. There are lot of shops and restaurants nearby. The staff at the Restaurants all of them were very helpful and I did not encounter any problem. The Wifi was O K although not that fast which is expected in a busy hotel like this. Had a bad one night experience with the hotel. Housekeeper kept ringing the door bell and even tried coming in when we were showering. Reception said it was because last night someone checked out using our room number in error. Terrible. Upon reaching airport we found that we left behind a sunglass and a travel pillow behind. Called and asked reception but housekeeper mention nothing was left behind. Probably because we complained them or it could be a usual practice for them to do this. Never stay here. Dishonest and discourteous staff around. From the time we checked in to the time we checked out, everything was superb. With an easy walk to shops and restaurants and the marina. The casino is just across the road. The staff were most accommodating and helpful at all times. The room was clean and very spacious with an outlook over the parks and casino. We really enjoyed our stay at Pacific. Well-located with just 5 minutes walk to shops/restaurants, and another 5-10 mins walk to jetty or terminals for snorkelling trip departure. On the day we check in, the receptionist was really attentive and lent us an umbrella when he saw that is was raining. We also felt that the room was really well-equipped, and really liked the super fast water-boiling kettle which saved us time and money. One small thing we didn't really like was that on a few days, we felt that the towels had a weird smell to it, but this might be subjective and vary from individuals. Overall, we had a great stay here and highly recommend it! Wonderful (5 days) short trip to welcome in 2015 - with 10,000 happy reveller for fireworks on the Esplanade. The Location is fantantic & staff very helpfull & assisting. Disappointed with No Room Service, No Foxtel or in-house movies, Limited Pool Area (No Spa or Sauna) Expensive Buffet Breakfast @ $ 29.95 ! Location.Refurbished rooms.Right on the esplanade....walk for miles along this gorgeous coastline. I was so surprised to see how wonderful the new refurbished rooms and hotel foyer were since this hotel has been in operation for many years. It's location is perfect if you love a beautiful walk along the esplanade. And certainly great if you want to browse around the cities shops. A stones throw from the Casino. Staff were polite and friendly. The room very clean and modern. I would stay here again. I found the rates reasonable.